Installing tile over Formica is a simpler tiling job than tiling over other surfaces. This is not to say that the job is quick and easy, by no means. Any tiling you do requires the three Ps--planning, patience and precision. You change the entire look of the kitchen when you install tile over your Formica countertops. Add new faucets, a splash of color on the wall and you have a new kitchen for a minimal amount out of your pocket. Measure the countertop and cut a paper template out of butcher paper. You'll need the measurements to purchase the tile. Don't forget the tiles that go on the edge. Check to see if the Formica laminate bonds tightly to the surface and the area is structurally sound. You need to have a good base when you tile over the Formica. If your only problem is loose laminate on a spot or two, reglue it and clamp it down rather than tearing off the entire surface. Rough up the Formica with sandpaper or the more-professional method of using a grinder with a rough diamond blade. You need to have it rough so the thinset sticks to it. Once you're comfortable that its surface is scarred enough, you're ready to waterproof the entire countertop. Cut a piece of waterproof fabric membrane the size of the counter. You'll want to overlap the edges, just in case there's a water leak somewhere. This prevents the water from penetrating the wood underneath, which might cause it to buckle. Use a thinset made for high performance. Spread thinset evenly and lay on the membrane. Smooth out the bubbles. If you find an area that isn't covered, spread a little more thinset on that spot and put on another layer of membrane. Overlap the membrane at the edges. Allow the countertop to dry overnight. While you wait, lay out the tiles on the template. This gives you a chance to arrange them and cut any that need trimming. Don't forget to leave space between them for grout. You'll want the countertop tiles to extend over the edge the height of a tile. This way, the tile on top of the countertop hides the edge of the one on the side. Apply the thinset to the membrane on top of the countertop and lay out your design. 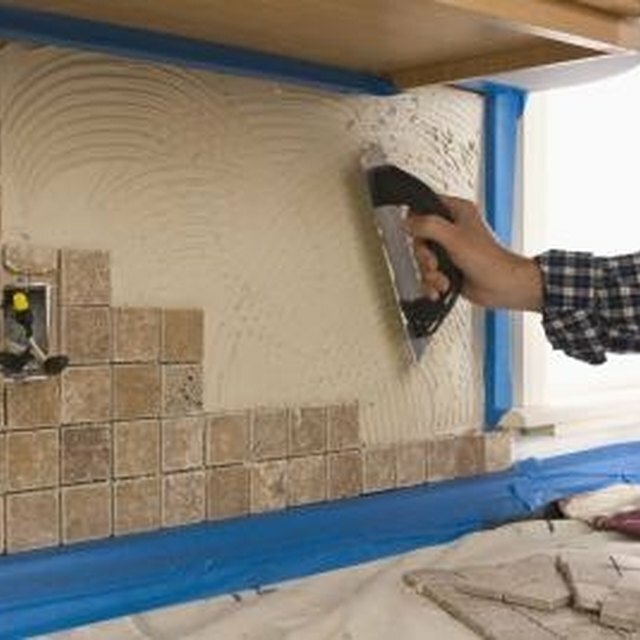 Attach a temporary board as a ledge to hold the tiles on the side of the countertop. You'll need to butter the backs with the thinset to put them on the side. The ledge holds the tiles in place until the thinset dries. Wipe any thinset off, but don't disturb the tiles. Let it dry overnight. Clean the tops thoroughly and apply a sealer. Allow the sealer to dry before applying grout. The sealer allows you to clean the tiles easier. Clean the faces of the tile again and wait a week until you apply two coats of sealer to the entire countertop.